A recipe you can make in advance is always a good idea on special occasions. Prepare this the day before and gently reheat to serve. Great served in dainty espresso cups as a canapé too. Warm the oil in a large pan over a medium heat and cook the leek and garlic for 5 minutes until softened. Add the potato, beans, hot stock and 100ml hot water. Bring to the boil then cover and simmer gently for 20 minutes until the vegetables are very tender. Using a slotted spoon, remove and reserve about a quarter of the vegetables. Purée the contents of the pan with a hand blender. Return the reserved vegetables to the pan and stir in the chopped parsley. Ladle the soup into bowls and drizzle over the truffle oil. Serve warm. 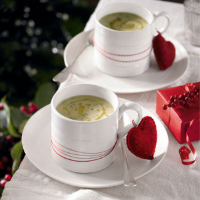 Try stirring 1–2 tbsp of cream in with the parsley for a creamy finish. This soup will freeze for up to a month. Thaw fully and reheat thoroughly before serving.